MainAll NewsInside IsraelKnesset Women's Committee Traumatized? Committee for Women apparently still recovering from embarrassing session in September, blocking video of the session from public eye. Something odd is happening to the documentation of a stormy session of the Knesset's Committee for Advancement of Women that was held on September 22, 2014 – a session that was apparently highly embarrassing to the committee's leadership. To this day, the Knesset website has no video documentation of the session, although such recordings are normally uploaded to the website shortly after the sessions end. The minutes of the session had also not been available on the website until a few days ago, although more than three months have passed since it was held. Minutes are usually uploaded within days of the sessions. For months, the only record of the session was a video shot by an amateur reporter and featured by Arutz Sheva. The special session was convened during the Knesset's summer recess, after MK Aliza Lavie (Yesh Atid) went on TV and said that nine women had been murdered by their partners since Operation Protective Edge had begun – a statement thought to be in line with the beliefs of radical leftist gender organizations, which attempt to portray a direct link between "male warmongering" and male violence toward women. In the course of the session, it turned out that the claim was false, and the number of women murdered in the summer months was two, not nine, meaning that no spike in violence could be attributed to the war. The committee erupted in controversy in the session when a group of female lawyers claimed that false accusations of violence filed against spouses in divorce proceedings have reached epidemic proportions. 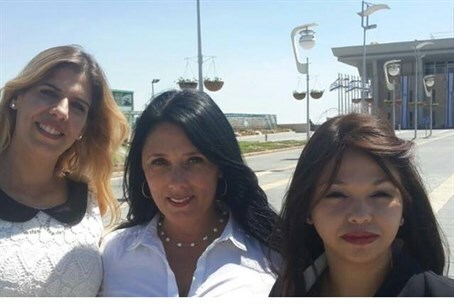 The lawyers – Pnina Yehezkel, Maya Alon and Moran Samun – head the Committee on False Accusations and Parental Alienation in the Tel Aviv / Central Israel District of the Israel Bar Association. They told the assembled Knesset members and women's activists that based on their long years of experience as divorce lawyers, they can state with complete confidence that false accusations are a daily occurrence. Representatives of women's groups, most of which are connected to the New Israel Fund, shouted “shame!” at the the three and some of them claimed that the phenomenon of false accusations does not exist at all. MK Lavie cited statistics she received in the course of the session from the Knesset's Information and Research Center, according to which the annual total of false accusations filed by women is 12, and the number for men is similar. Ronen, who took part in the session, told Arutz Sheva that over 20,000 domestic violence complaints are filed every year, and that he personally knows people who have had more than a dozen false complaints filed against them in the course of a single month. He called for steps to be taken against the Knesset's Information and Research Center for apparently misleading the Knesset. "Even if MK Lavie's statistics referred to charge sheets that were filed – the police have already appeared before the Knesset and provided a number that is six times as high. And regrettably, in most cases, no charges are filed, even when they are fully justified," said Ronen.